I’ve pretty much lived on these Peanut Butter Chocolate Chip Protein Balls since having my daughter last winter. They are my go-to when I’m craving something sweet yet don’t want to eat something bad… like cookies or cake or whatever other sweet item that might be calling my name. I’ve always had a sweet tooth, but since I was pregnant with my daughter it was amplified and stayed with me after I gave birth to her. That’s where these protein balls have come to save the day. I typically make this recipe with Barleans Forti-Flax. 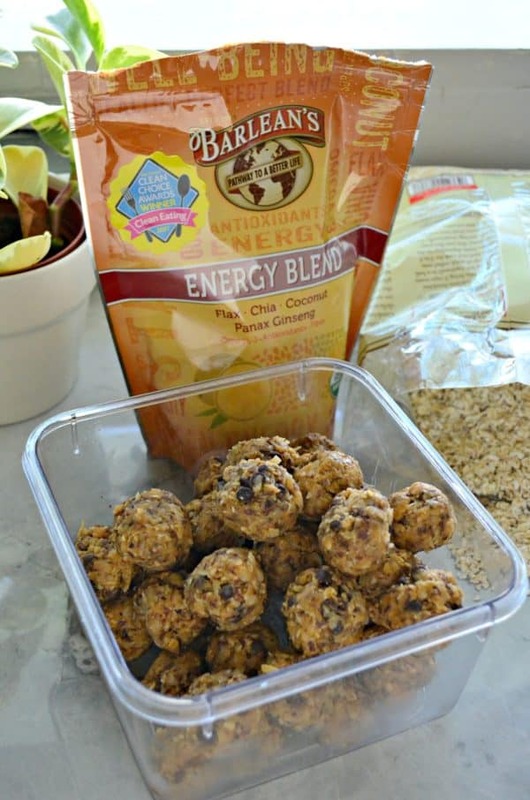 Since Barleans challenged me to come up with a tasty (and healthy) snack I tried the Energy Blend for the first time. The Energy Blend provides a potent combination of nutrients from whole superfoods to power your active lifestyle. Formulated with traditional energy producing Panax ginseng, along with organic flaxseed, chia seed and coconut, Energy Blend is a nutritional powerhouse of Omega-3 (ALA), antioxidants and fiber. Let’s get real for a minute, this mama can use all the extra energy she can get. I’m caring for two young kids who keep me busy and on the go! Barlean’s partnered with LunchBots for this challenge. LunchBots was started by Jacqueline Linder, a mom who was concerned about chemicals in plastic leaching into her food. Today, LunchBots is still a family-owned business. All LunchBots are ethically made 18/8 stainless steel containers. I was excited when they sent me one to try. I’m on the go and always find myself either needing lunch on the go or snacks on the go. Since I’m currently on a dairy-free diet I have to pack myself food or else I’m starving. 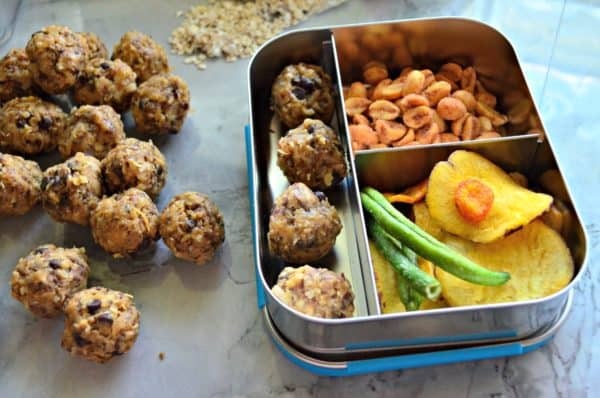 I go to boot camp with the kids a few times a week and I like to pack myself snacks to refuel after boot camp while my son plays at the park and burns his much needed energy off. I throw in a few of these Peanut Butter Chocolate Chip Protein Balls, plus dehydrated veggie chips, and some spicy sriracha peanuts. Its the perfect snack balance in my opinion and the perfect balance of salty, spicy, and sweet! 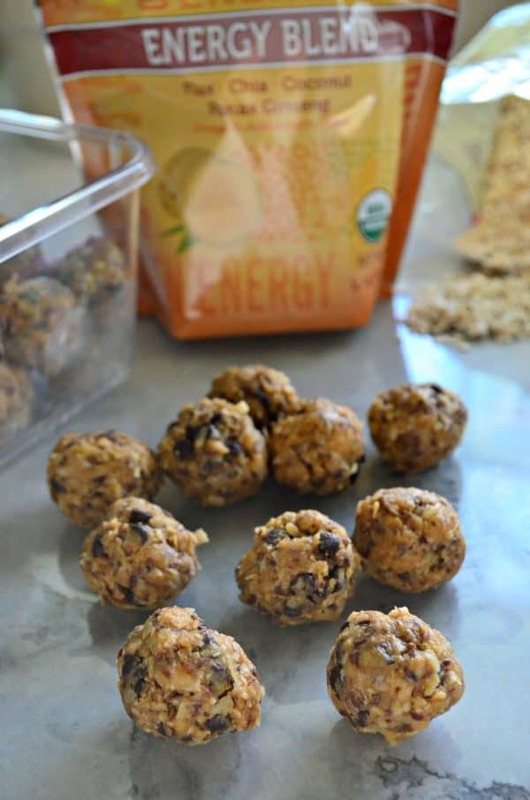 My whole family loves these protein balls and even my toddler thinks they are a treat. If he catches us eating one he demands a “peanut butter ball”. Of course, I have to make two batches since I don’t feel that he really needs the Energy Blend— lord knows he already has plenty of energy! These bites are gluten free thanks to the oats I used and dairy free because I found a delicious dairy-free chocolate chip! They are kind of my life line these days. 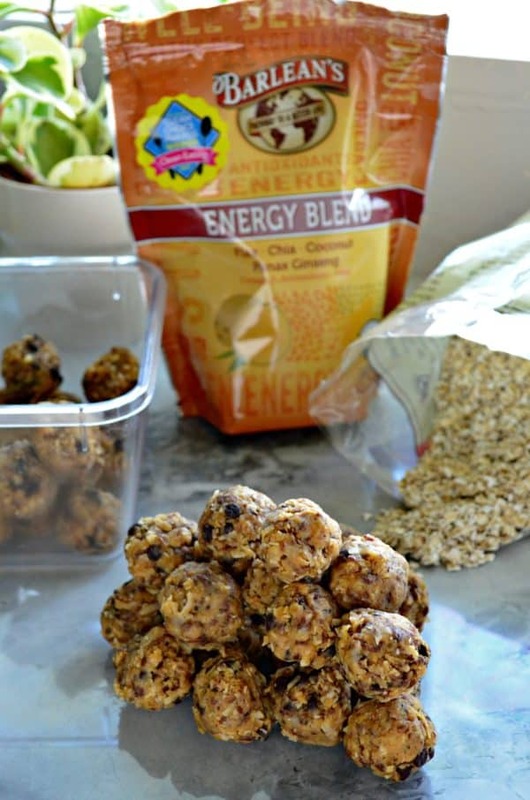 I love to store these Peanut Butter Chocolate Chip Protein Balls in a container in the freezer (like the one pictured above). I find that they stay put together better. Although you can keep them refrigerated if you like. My family typically goes through a batch in a week. Since they are frozen I would tell you they would be fine for up to 3 months, but I doubt they will last that long in the freezer. 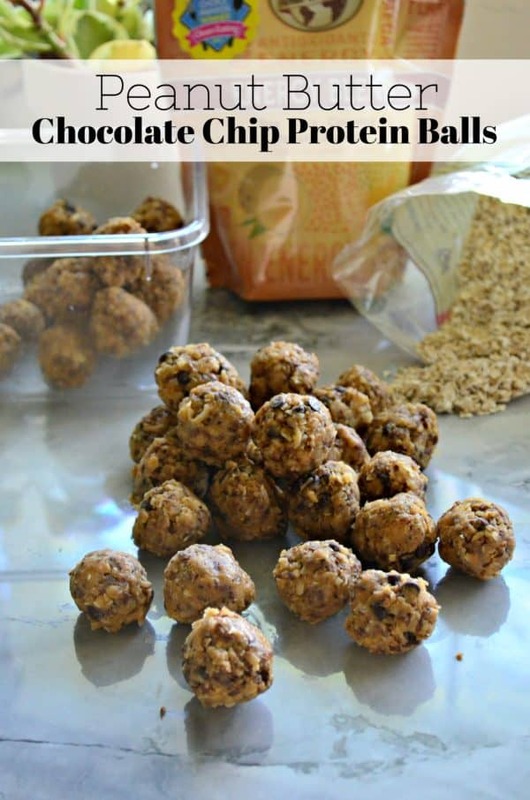 They are addicting and the perfect pick-me-up snack or even after dinner healthy “dessert”. If your looking to help curve your sweet tooth I invite you to try my recipe for Peanut Butter Chocolate Chip Protein Balls! I love having snacks like this on hand for when hunger hits! Yes–I find if I can keep healthier options on had I have less chances of eating bad.